I knew we weren’t going to leave Colorado before making it to Mesa Verde, the largest and most famous archeological site in the Southwest known to me. 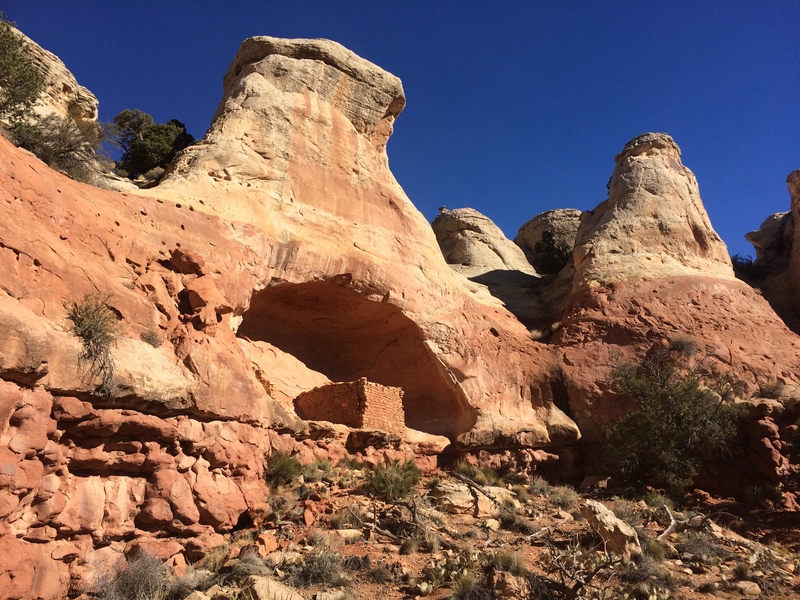 These ancient cliff dwellings were discovered by local ranchers only in the late 1800s, and then later became a national park in 1906. 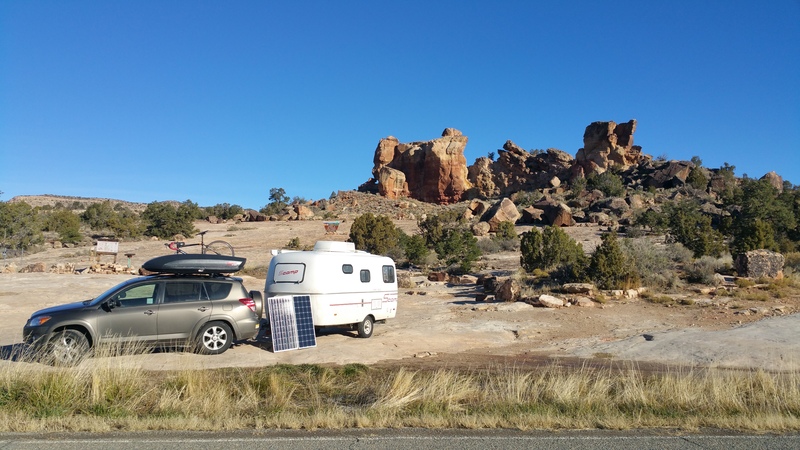 Now this popular national park has giant parking lots loaded with tour bus parking zones, and has a third party campground that hosts over 200 campsites. It’s a damn popular place. However, due to the off-season and the winter storm that passed through the night before our arrival, most archeological sites and all hiking trails had already been closed. As a result the park was mostly vacant which ended up working in our favor. As I wrote in my previous post, we bugged out of Zapata Falls Campground earlier than we liked in order to get a head start from the storm. 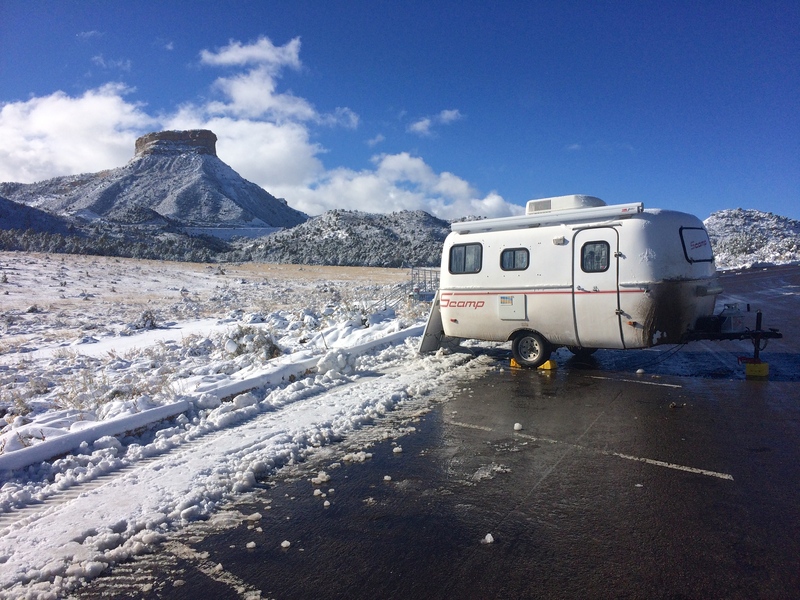 We spent the night in nearby Alamosa and set out the next morning for Mesa Verde, but we were hit by the winter storm earlier than expected. It was scary driving and towing up over Wolf Creek Pass with all the snow and ice, but we made it safely without incident and took a break in Durango. While at a café in Durango a local told me that the nearby Sand Canyon was worth checking out. 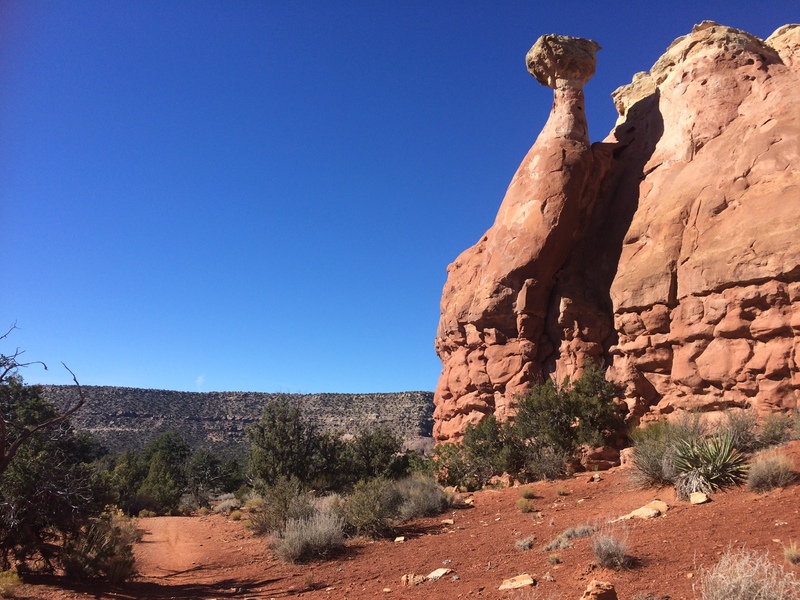 Upon quick research I saw how beautiful and fascinating Sand Canyon was—the Sand Canyon Trail was actually a part of Canyon of the Ancients National Monument and was only about a half hour drive west of Mesa Verde. Albeit much smaller than the sites at Mesa Verde, the archeological sites that trickled the Sand Canyon Trail hardly saw any visitors and was clearly a local gem. I made note to check it out after Mesa Verde. 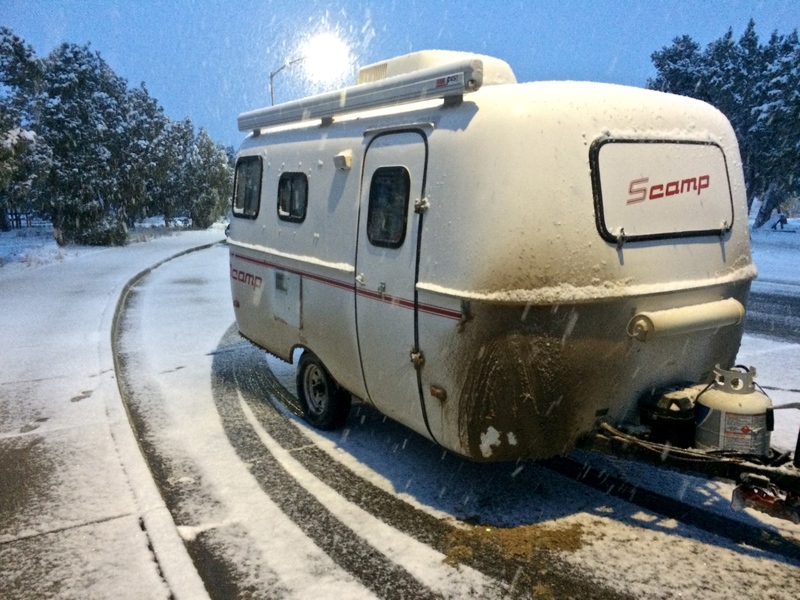 That night, after attempting to search for a BLM campsite and slipping and sliding in snow with only a few minutes of light remaining, we resorted to spending the night at a rest stop just a mile west from the Mesa Verde entrance. Signs clearly indicating that overnight camping was prohibited were plastered all over the rest stop, but we figured it was safer to hunker down there than drive in the dark with snowfall and icy road conditions. We weren’t the only ones spending the night at the rest stop. There were 3 other trucks and another van idling their engines as we pulled in. 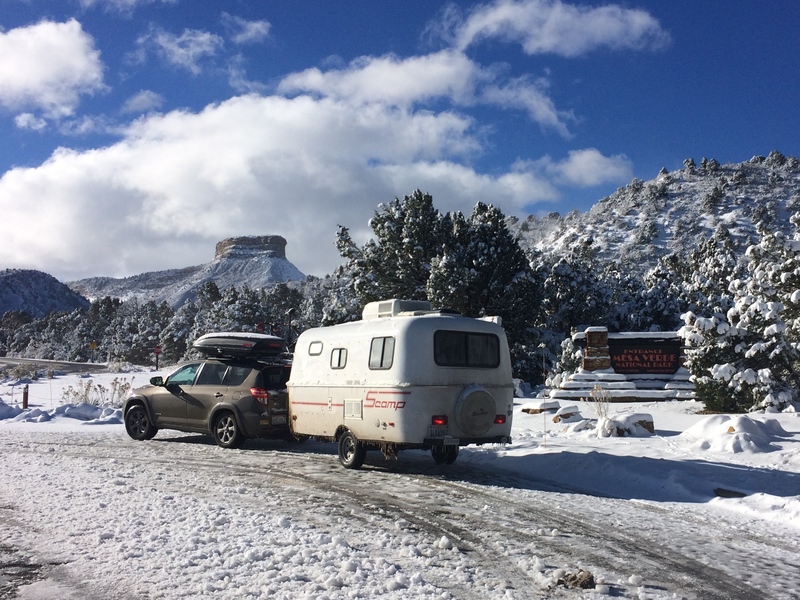 The next morning we finally made it to a snow-covered Mesa Verde. Trailers weren’t (and aren’t) allowed in the park. We unhitched our trailer in the parking lot specified for trailers before making our way up. At that time of year only Chapin Mesa was available for visitors. The entire Wetherill Mesa and Cliff Palace Loop were already closed, meaning the Step House, Long House, Cliff Palace, and Balcony House were off limits. All hiking trails were closed due to snow and ice. 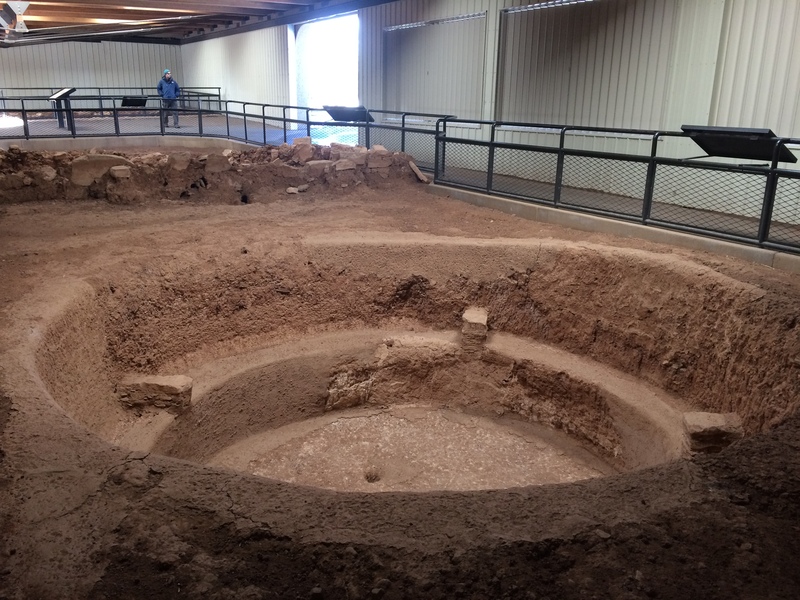 Within Chapin Mesa were the highly informative archeological museum and the Spruce Tree House. 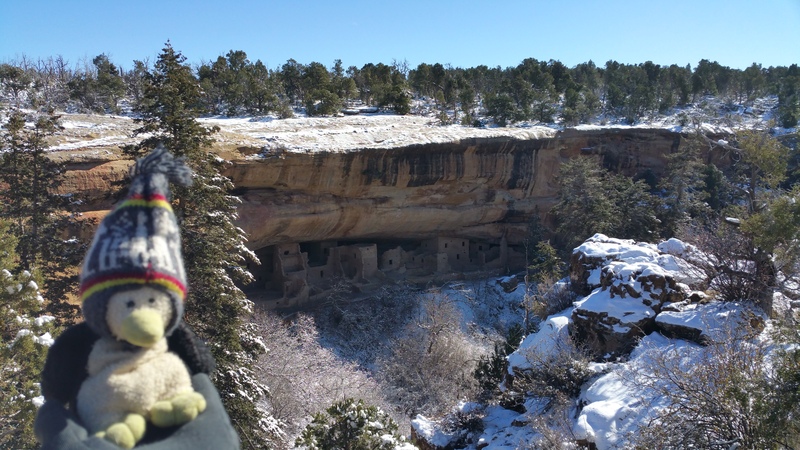 Normally the Spruce Tree House is the only cliff dwelling open to visitors during the winter via free guided tour, but only 3 weeks before, large rocks above the Spruce Tree House had collapsed. Not only was it unsafe to enter, the site was becoming incredibly endangered. As a result we were only able to see Spruce Tree House from a distance. Because the 6-mile Mesa Top Loop was being cleared of snow and not yet open, I browsed the archeological museum, which ended up being more fascinating than I expected. Mesa Verde wasn’t just cliff dwellings—the park included more than 4,500 sites, with only 600 of them being dwellings! 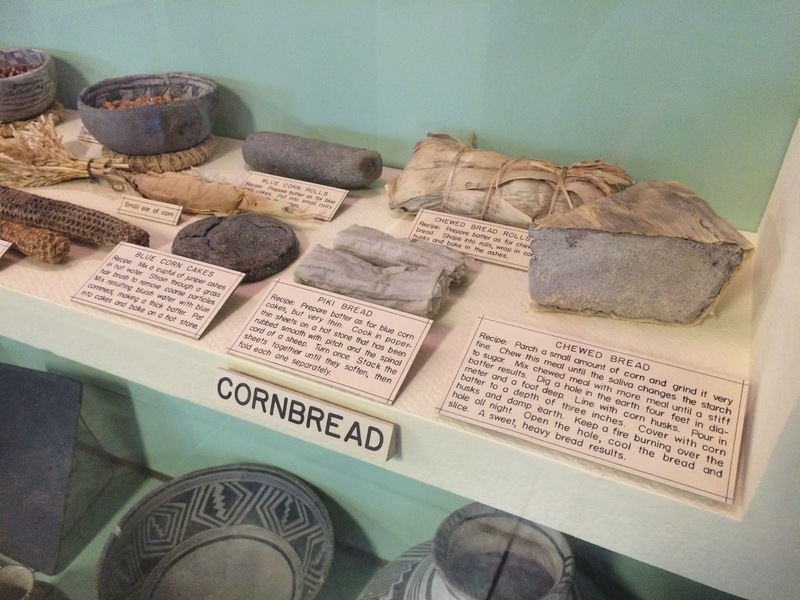 At the museum I learned more about archeological theories, anthropology, the natives’ time periods, generations of people, their food, clothing, tools, weapons, pottery, and more. Upon excavating the sites, archeologists discovered numerous artifacts, which were all now on display in the museum. 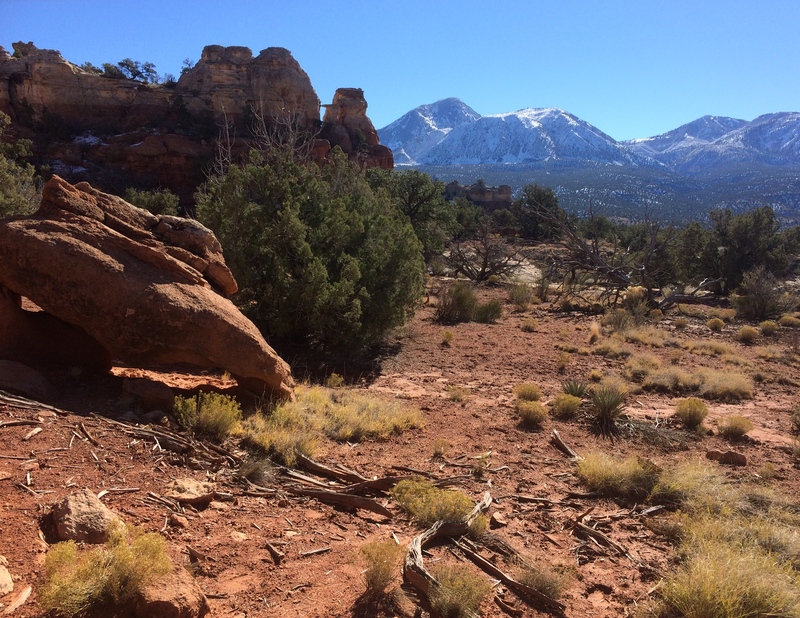 About an hour later the park rangers announced that the Mesa Top Loop had been cleared and was open. I grabbed Chris from the café and we headed out to drive the loop. The short loop had various stops, lookouts, and points of interest along a one-way single lane road. During the peak season I imagine this road is quite congested with wait times for parking. Thanks to the off-season we were followed by only one other car and enjoyed every pit house with serenity and peace. Normally visitors should spend at least a whole day at Mesa Verde, but with most sites being closed, we were done by around 3pm. We spent that night in the nearby town of Cortez. The next morning we drove the 30 minutes to the South Sand Canyon Trailhead, an excellent trail for running, hiking, and mountain biking. With limited time I hiked the 4-mile-ish loop from the Sand Canyon Trail to the East Rock Creek Trail. More information and a map could be found on the BLM site here. 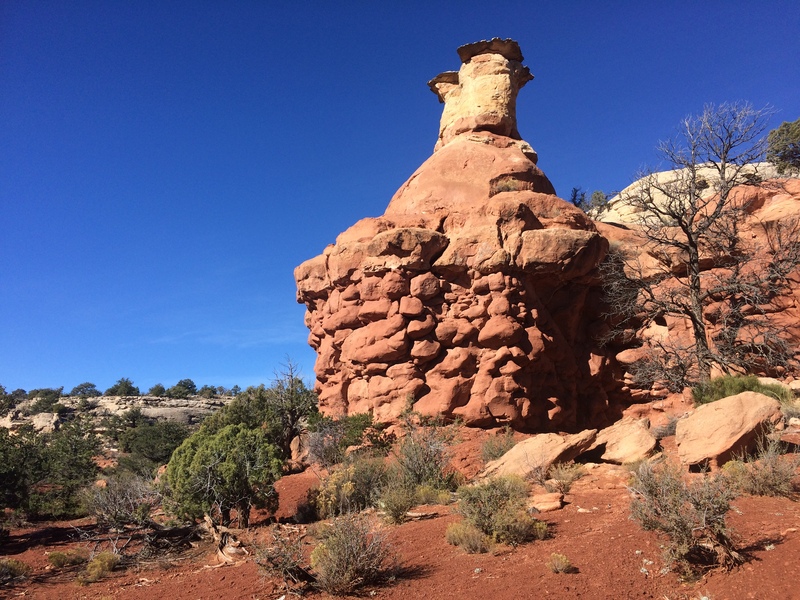 There were a number of unique natural rock formations. 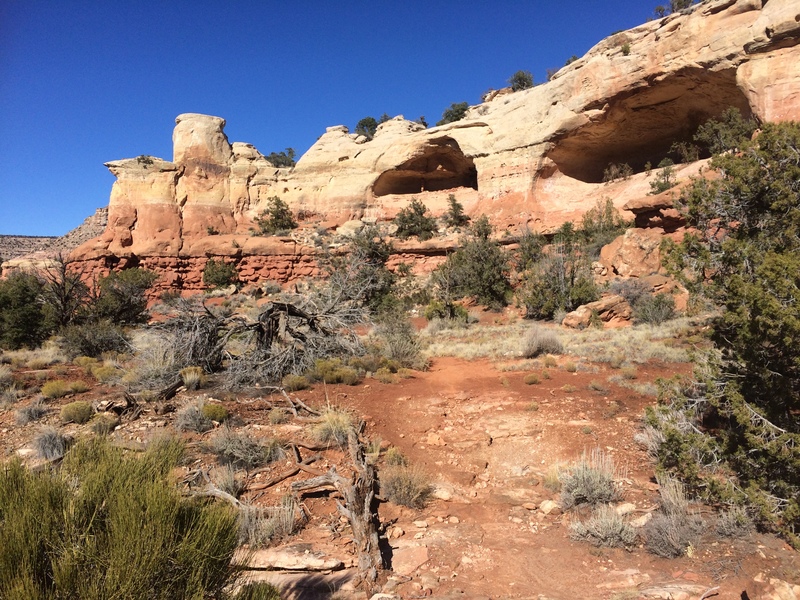 To my surprise, there were more cliff dwellings on the trail than I expected. Along the southern trail connecting East Rock Creek with Sand Canyon, I stumbled upon more sites. 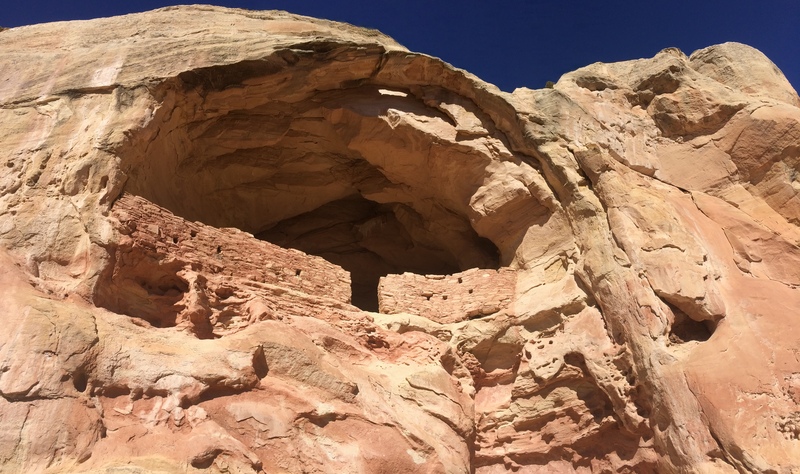 Imagine living in these cliff dwellings. This would have been your view. I quickly made it back to the trailhead/parking lot, ate lunch, and headed out again. The archeological sites of Mesa Verde and Sand Canyon, undoubtedly fascinating for those with an appreciation for anthropology and history, were our last destinations in Colorado before returning to Utah. If you’re ever visiting Mesa Verde, take the time to drop by Canyon of the Ancients National Monument too.